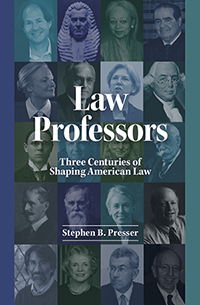 Stephen Presser, Raoul Berger Professor of Law Emeritus, argues in his new book, Law Professors: Three Centuries of Shaping American Law (West Academic, 2017), that there is no country in the world where law professors have had more of an influence on shaping the law than in the United States. Beginning in the 18th century with William Blackstone and an examination how the English common law set the groundwork for American law, Presser profiles an individual legal scholar (or small group) in each chapter, moving through the years and schools of thought in legal education. Why did you decide to write this book? And how did you decide to write it the way you did, each chapter focusing on a different law professor? The book diagnoses what you see as the fundamental problem with the direction the legal academy has taken, conflating law and politics and how law professors are responsible. Can you explain that? I think where things went wrong, if not earlier, was with Oliver Wendell Holmes Jr. and his book, The Common Law. There’s a whole chapter on Holmes and what he said is “The life of the law has not been logic. It has been experience.” It’s revolting to have no better reason for the rule of law than that’s the way it was done in the time of Henry IV. In particular, he attacked Christopher Columbus Langdell for trying to suggest there really was an organic, coherent common law tradition. For Holmes, judges were really legislators and he seemed to think that’s what they should be doing. I think that’s profoundly and sadly wrong. What judges are supposed to be doing is applying preexisting rules—not turning them in new directions and not being legislators. If judges think they can make it up as they go along, the security of the person and property that the rule of law is supposed to guarantee goes right out the window. Now Holmes was talking about private law but Holmes’ notion in the hands of the group we know as the legal realists and then later the critical legal studies people was basically taken to mean even with constitutional law, it’s the job of the judges to change the constitution to fit the needs of the times, the so-called living constitution notion and what I suggest in the book is that that couldn’t be more wrong. The correct view, in my humble opinion, is the attitude that is perhaps best exemplified these days by the late Antonin Scalia, who is also the subject of a chapter. That attitude is essentially, that you try to interpret the Constitution in the manner those who wrote the language understood it, and if you don’t like that manner, then you amend the constitution or you pass a law. You use the popular branch, the legislature, or the people themselves to change what the law or the Constitution is but you don’t do it through unelected judges. In your view, what’s the solution? There are a lot of things we can do. One solution contained in the book, is to realize that all through our legal educational history, there has been a reaction to the ideas of legal realism and critical legal studies and the living Constitution approach. What I tried to do in the book is illustrate that. That means looking at people like Herbert Wechsler at Columbia, Paul Carrington at Duke, and Mary Ann Glendon at Harvard, who are all subjects of chapters. I wanted to show “look, this dominant view in the academy about the law being malleable and the law being politics isn’t all there is.” There’s a different tradition that we can study and we can bring forward. You have a fascinating chapter in the book about former Northwestern Law Dean John Henry Wigmore, and you suggest that his legacy undervalues his contributions. How would you characterize them? He was a pioneer at three or four different things. One of them was he was a comparativist. As the book points out, he taught in Japan and he tried to think about what things are common in the world’s legal systems; he wrote a book called Panorama of the World’s Legal Systems. Most American lawyers and law professors don’t know anything about any other country’s law and he was a towering figure who tried to think about that. That’s one thing, another thing is he’s responsible for the powerful tradition at Northwestern to try to do empirical analysis of law and to try to understand how the law really works. His treatise on evidence is an attempt to do that. He asks what happens at trials, how is evidence presented, what parts of what’s presented ought to be believable, what’s not? And so he writes this 12-volume treatise that has never been equaled. So we’d say he’s both an empiricist and a treatise writer and his achievement is monumental and fundamental and all but ignored except among scholars of evidence these days. In his era, he knew everybody who was anybody. He had the enormous respect of people like Holmes and the great Harvard Law School Dean, Roscoe Pound, who began his academic career under Wigmore at Northwestern, but then Chicago stole Pound and then he moved on to Harvard. And everybody and his uncle wanted to get Wigmore to teach for their law school, but he refused to leave Northwestern, which is a rare thing to do. He was a loyal guy. To say nothing of the fact that he built the chimes to play the Law School song. As it says in the preface, the book is a love letter to the teaching of law and in a way, a love letter to Northwestern, where I was tolerated and where I was allowed to do all the things that I want to do and to be a voice that’s a little bit different from most of the folks on the faculty. I was trying to speak to a very, very broad audience and to do something that was a literary effort as well as a piece of legal scholarship. I wanted to write something that would be of interest to everybody, but particularly of interest to people who pass through Northwestern and wondered what it was I trying to do with them.